Lowdown: In order to save the people of earth, an astronaut travels through a warmhole to alternative earth like planets. Every two to three years, director Christopher Nolan comes out with a new movie that has the world bending down to kiss the hem of his gown but leaves me rather puzzled. I liked his first Batman movie, but did not see what the big deal was with the second or the third. And while I do admit there are nice ideas at the core of The Prestige and Inception, I also think their execution was rather lacking, and not for lack of budget; it is clear Nolan and I work on different wavelengths. Now, with Interstellar, the question I was asking myself is whether Nolan can finally get me on my knees, too. His starting point is a good one: here is a science fiction movie dealing with bread and butter themes of the genre, notably space travel. So, did Nolan do it? Interstellar’s premises are interesting enough. We start of at an earth of about a hundred years or so into the future. It’s not a bright future: things are dying, there are no animals to be seen, and corn is pretty much the only thing out there still edible. Oh, and stormy dust clouds envelope everything most of the time. We are not told how the earth got to this, but we are told that in this earth there are no more armies because there is nothing to fight for and human population has been drastically reduced from our current peak. In this setup we are introduced to Cooper (Matthew McConaughey), a farmer, a widower, an ex astronaut, and the father of two kids – most notably a very smart girl, Murphy (played by various actresses, most notably Jessica Chastain). Through a bit of this and that, our Cooper stumbles upon a NASA base led by an old professor (Nolan regular Michael Caine). There he learns the latest in planet survival news: mysterious aliens have established a wormhole near Saturn, through which earth like planets in another galaxy have been detected. Volunteer astronauts were sent to each of those in one way missions, with three radioing favourable findings back. The plan is to now pay these a visit so as to initiate either a Plan A (migrating the people of earth to the successful candidate) or Plan B (carrying thousands of fertilised human eggs in order to establish new human population on the planet, thus at least maintaining the species despite giving up on earth). The plan was short on an experienced pilot, but hey, now they’ve landed Cooper! All he has to do is leave his family behind before hopping aboard a spaceship with the professor’s daughter (Anne Hathaway) and a Minecraft style robot and go star trekking to save the people of the earth. The end result is a spectacular looking film spanning close to three hours as it goes about its way rather slowly. Talking pace, there are obvious queues from 2001: A Space Odyssey, evident in both grandness of scale and scenes featuring one spaceship docking with another. There is also quite a collection of famous actors thrown into the mix, like John Lithgow, Casey Affleck and Matt Damon in addition to those I already mentioned. 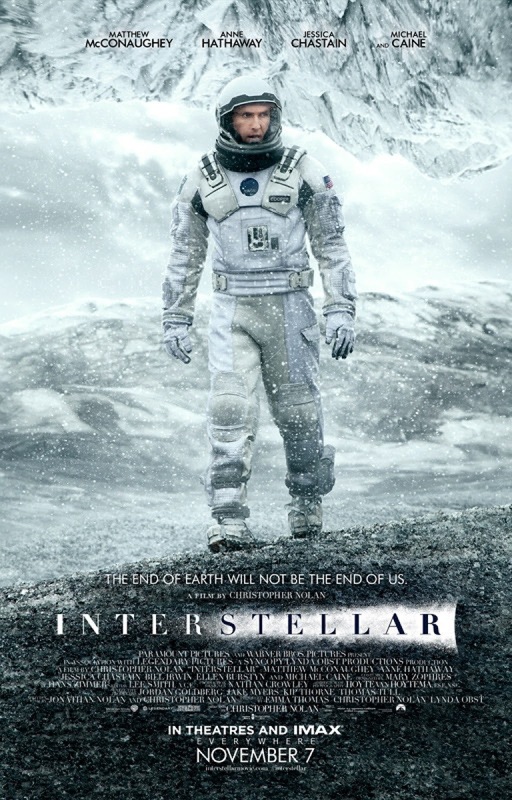 So yeah, as space operas go, Interstellar delivers a quality experience. Then there is the matter of the messages Interstellar is trying to tell us. As stated, this is my main area of conflict with Nolan. Sure, I appreciate the messages about needing to look after our planet; I can also appreciate the message about humanity needing to seek a future for itself in space (objectively speaking, it’s necessary for the survival of our species). But I do have problems with some of the messages and, more specifically, with the way the core messages are delivered. It starts with basics. Murphy, Cooper’s daughter, acquired her name as some sort of the tribute to the famous “law”. Murphy is upset because she’s named after things going wrong, but Cooper corrects her – the “law” is not about things going wrong, but rather anything that can happen eventually happening. This is no coincidence, because that’s exactly what the film depicts; yet as scientifically accurate as the film might try to portray itself in oversimplified discussions of wormholes and black holes, there is no denying science is dropped out of the window at later stages in favour of making the statement Interstellar wants to make. In other words, I felt like Interstellar was not full of stars, like the movie it outsourcing much of its inspiration from, but rather full of sh*t.
Your own mileage may vary depending on your sensitivity to such issues. Normally, I can turn a blind eye in favour of a good movie; Interstellar annoyed me mostly because it does go a long way to try and explain its “science” in catchy, pseudo scientific, ways. You may still argue that you don’t care, which is perfectly within your rights, but if that is the case then let me ask you this. Those aliens that stepped in to try and help save humanity: don’t you agree they went the very long and improbable way about their quest? Overall: Interstellar is a nice sci-fe movie that, as per usual Nolan procedures, fails to stand out as the epic it aspires to be. 3.5 out of 5 spaced crabs.